While the author ensures we understand that we don’t make Jesus attractive (He already is), he seeks to remind us that when someone truly encounters the beauty of the Christ, the lesser gods of this world aren’t nearly as attractive. All of the earthly gifts God gives can be for our good and are meant to be enjoyed, but they make terrible gods. John Calvin once observed, “Man’s nature is a perpetual factory of idols.” We should instead, as disciples being transformed by the Holy Spirit, help others see the wonder of our awesome God and the gospel of His Son… and the deficiency of all our lesser gods. Checked on the locale of your treasure lately? This entry was posted in Discipleship, Quotes and tagged Christ, Christian, Christianity, Churches of Christ, Denominations, Jesus, John Calvin, Origen, Religion & Spirituality, Thomas Chalmers, transformational discipleship. Bookmark the permalink. My Pastor just gave me this book. After reading this snippit I’m anxious to start reading it. Thanks! It is indeed a good friend who turned you on to this piece. I must warn though, it is one of those bitter-sweet writes. 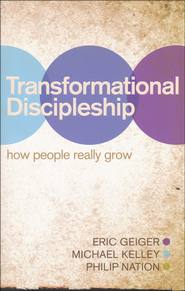 It’s challenging, even life-wrecking at times, but as the author brings us to an authentic view of the gospel, it is to open the door to what discipleship looks like in a transformed life… a life in Christ. Thanks for swinging by and blessings to you today. Thanks Mike for highlighting that we must become less so Jesus in us can shine His light through us , we must put our evil flesh to death that puts our own selfish needs first and we do this by choosing to walk in Love by The Holy Spirits empowering and not out of fear but because of Love for the Lord and others. Thanks Scott, blessings to you also.